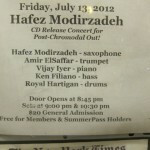 Quite a line-up: Hafez, saxophone; Amir ElSaffar, trumpet; Royal Harrtigan, drums; Vijay Iyer, piano; Ken Filiano, bass. Vijay performed at Spruce Street Forum back when he was still a whipper-snapper living in San Francisco and it’s nice to see that he has become a highly respected, well-deserved presence in the music scene. All night long the music was remarkable. 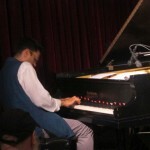 The piano had been re-tuned so all that Vijay played had very different and highly effective sounds. Hafez and Amir’s duos were ear-popping as was Royal’s solo especially the one where he played with his hands only. The second piece of the night was dedicated to Fred Ho. 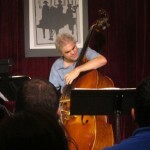 I went especially to hear Ken Filiano as he and Anders Nilsson are coming to perform in the Fresh Sound music series in San Diego on Oct. 2 and, once again, his playing struck my heart. It was fun to see Ken and Vijay give each other appreciative nods after particularly striking connections between the two of them. I luckily bumped into Fred outside the club so we had a chance to catch up. 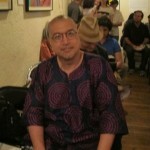 He also performed at SSF years ago with the Brooklyn Saxophone Quartet. 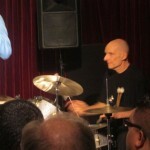 David Bindman, also in BSQ, was in the audience too -- a star studded band and crowd. This is when I wish I were Robert Bush who writes so eloquently about San Diego concerts but, lo, my musical descriptive skills are lacking. 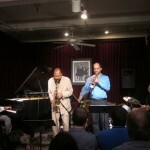 I will just say that this last night during my month long visit to NY was one of virtuosic music.